are produced with our technologies and software products. We work where millions of people take holidays every year. VIVA develops software for graphic design as well as for optimizing and automating marketing and layout processes for corporations in all branches as well as the graphics industry. With more than 200,000 users and customers, VIVA today is one of the leading suppliers of media services and software products. Publishing, Design, Typography and color is (our) life. Therefore we see ourselves primarily as a software technology company and solution supplier in the service of our customers. We are very proud that annually millions of publications (posters, books, catalogs, magazines, etc.) are produced with our technology and software products. We develop the best programs world-wide for graphic design and automation of marketing and layout processes. Every day we improve our software to the advantage of our customers, who with their ideas and requests provide an important impulse for our development. We listen to our customers and understand their wishes. Because of our size, our innovative strength, our wide product portfolio and many years of experience, we can react very flexibly and individually to our customers’ requests and solve or carry out difficult tasks ourselves in very short time spans. We know of no other company in the world that can bring services in this form and extent based on their own software. 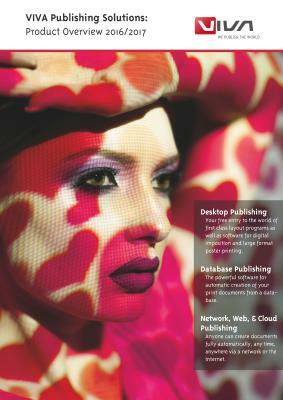 For more than 20 years, VIVA has been one of the pioneers of publishing software. Already in 1992, for example, Viva invented the principle of the separation of form and function for layout programs. Today millions of people work according to this principle, which has been taken over by all current layout programs. Invention of “Database Publishing” based on the layout program “LinoPage” (1989-1991) and later “VivaPress” (1992-1994), “VivaPress Professional” (1994-2005) and “VivaDesigner” (from 2005). “Database Publishing” connects a data source to a layout program for manual or SEMI-automatic creation of graphic documents. “Database Publishing” is a registered trademark of Viva GmbH. Invention of “Network Publishing” and the first publishing server world-wide in the late 1990’s. “Network Publishing” is the further development of “Database Publishing” with which a user can create graphic documents FULLY automatically from any application. Today the term “Web-to-Print” is used extensively, which however presents just a fraction of the application in the sense of “Network Publishing”. to develop a layout program for Mac OS X on Intel (Feb. 2006). to offer publishing software for renting as well as purchase (2004). to offer a free of charge version of a complete commercial layout program (2004). to offer the free of charge Runtime versions for imaging studios, so as to be able to output customer documents with any service provider (1992).